Untitled #281 was created by extreme mutation and evolution of bird calls from original recordings carried out over a period of fifteen years (1995-2010) in multiple wilderness locations of Australia, New Zealand, Brazil, Spain, South Africa, Costa Rica, Mexico, and Peru. The most dramatic antithesis of any “birdsong” piece you could imagine. Francisco López is one of the most influential and prolific sound artists in the world, with a career spanning over 30 years. The majority of his solo works are untitled, making it even harder to sort through his output. Unlike other prolific creators such as Merzbow, Maurizio Bianchi, or Machinefabriek, who imbue their work with precise concepts and defined meaning, López encourages (indeed, often enforces) a kind of ‘reduced listening’ in the tradition of Pierre Schaeffer. In a live setting he mandates that audience members wear blindfolds while he plays in the dark, his mixing console covered by a black sheet. With important exceptions, this refusal of referentiality extends to the austere packaging accompanying his untitled work. Those pieces that do have titles tend to gesture towards a place, a context which influences how we may receive the work even though the connection to said place remains opaque. What little information López does provide is often restricted to where and when the source recordings were made. He is being transparent about his sources while simultaneously encouraging the listener to disregard this information, as if to say, “don’t focus on what I’m doing, but what I’ve made.” Paris Hiss, recorded in Madrid, was produced through hundreds of generations of recording two blank cassettes back and forth. Understanding the concept is essential to the piece, but his Trilogy of the Americas is more indicative of the blurry site-specific nature of much of his work. La Selva, Buildings [New York], and Wind [Patagonia] reflect his willingness to produce site-specific work while also confronting more traditional bioacoustics head on with his unwillingness to place “natural” or “man-made” sounds in any kind of a hierarchy. In an essay accompanying La Selva (taped shut with an argument for keeping it that way), López writes that he “conceive[d] this as an ideal form of transcendental listening that doesn’t deny all that is outside the sounds but explores and affirms all that is inside them.” Though each of these records contains lengthy liner notes detailing their creation, López is adamant that the sounds stand alone. His pieces are self-referential, working to sever any residual associations of place or cultural relevance. Still, as Joanna Demers puts it in Listening through the Noise, “the boundaries that separate the work from the outside world are blurry,” and in that blurriness there is room for creative production. A PhD in ecosystems biology means his day job has taken him around the world, and so the recurrence of natural phenomena in his work is not be surprising, but nor should it be considered of particular significance. La Selva (Spanish: The Jungle) remains one of his most impressive recorded works, based on recordings made in the La Selva Biological Station, a protected rainforest in Costa Rica. 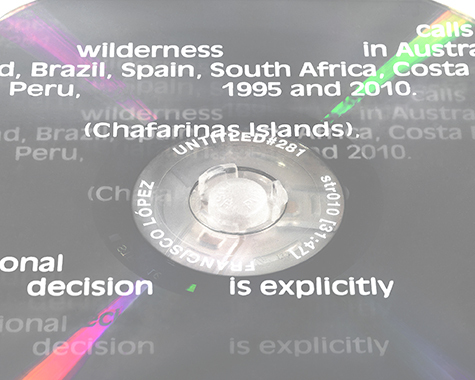 Unlike traditional bioacoustic recordings, which emphasize animal calls in isolation for scientific purposes, López is driven by no such distinction. Foreground and background meld into an indistinguishable present, the sounds of animals, plants, water and wind all co-existing. Its sequel Buildings, with its air conditioners and boilers and computers, is no less the work of someone thinking in terms of (eco)systems, despite the technological emphasis. Wind, as López points out, is neither biological nor man-made, and its interactions with the landscape occur on a far grander time-scale. His austere recordings from the southernmost region of the Americas is clearly removed from the natural sounds of the jungle or the mechanical systems of the modern city. These specific locations produced recordings that are themselves still autonomous, and as sound works should be evaluated on their own terms, according to their internal logic and being. The sounds of Untitled #104 or Untitled #180, sourced from short death metal samples and avant-garde cinema, respectively, are not ontologically different from his recordings of the rainforest. It is difficult to discuss music that insists on the non-referentiality of its sounds. Both art and popular musics have long histories to draw on, and so particular instruments, timbres, modes, melodies, harmonic progressions, and titles are imbued with meaning granted by context and tradition. Even non-representational, so-called “Absolute,” music which situated music as the highest of art forms unencumbered by text or narrative in order to reach its grandest potential still developed its own idioms and traditions. After Pierre Schaeffer, the practitioners of musique concrète became divided regarding whether the sounds being manipulated had meaning. When we hear a sound that is recognizable -as a train whistle, the rhythm of urban traffic circulating, the wind blowing on a seaside cliff, birds singing in the early morning, and so on- should the composer consciously make use of the associations these sound may bring to mind, or instead insist on a severe form of reduced listening? François Bayle, for instance, focused on abstract and unidentifiable sounds, whereas Luc Ferrari played off the affective associations of his recordings. Birdsong is full of referentiality and and cultural associations. Birdsong is also one of the most common inspirations for music and is also a recurring subject for field-recordings, from Messiaen to Environments. The latest in López’s Untitled series features dense transformations of birdsong quite unlike anything else you’ve heard. Untitled #281 is not meant to foreground particular kinds of birds, to make them identifiable, nor to conjure particular associations or feelings or moods. Coming on the heels of his recent ecological work (Hyper-Rainforest / Yanayacu, Untitled #308) recorded in many of the same locations, the use of bird recordings seems somehow more significant. It is an antithesis of everything the ‘birdsong’ has meant to music thus far. There are no melodies or highlighted rhythms, just constant flux. It is not about isolation and identification, but perpetual mutation and evolution. If this piece can be said to be “about” anything, it’s this. Mutation and evolution are recurring themes in López’s work, and #281 foregrounds mutation as an internal logic. One can’t really tell, but I take it that these transformations unfold in front of us, so that we are occasionally given glimpses of the source material as the mutations progress or regress. The composition can be quite dense and constantly moving, a highly structured and dynamic 32 minutes. The source recordings here are sourced over 15 years from all corners of the globe. As is typical of much of López’s work, the piece explores a wide dynamic range, at times very quiet and at other times thunderously loud. The opening movement is very quiet, a faint scratching rhythm and haunting calls that sound more like whales. Around 2:30 a high-frequency cluster of sound gradually begins to crescendo, at first reminiscent of the singing of water through pipes, then more like a chorus of insects, seemingly chaotic and multi-layered. New sounds are slowly introduced, at times seeming as though they may fall into a regular rhythm, only to speed up or slow down, or fade away entirely. López’s work can sound threatening and often the unexpected movements are legitimately surprising. By the tenth minute, staccato rhythms of static are peaking my levels, which we are told is intentional and the result of the peaking will vary depending on the headphones or speakers being used. The loud rhythms cut out suddenly, replaced by a chorus of moans and grunts, sounding more like pitched down frogs than any bird I know of. Low, sustained moans build until a mid-range tone seemingly relieves them, the voices gradually exiting as the piece begins to inhabit a more spacious and desolate atmosphere. Despite the the faint sounds of air moving, the reverb on the cries again sounds more like a mournful whale, fading into the distance as the piece approaches its quietest passage. A chorus of high-frequencies cries reemerges from the silence, almost digital in character. A call repeats itself again and again. Is that a faint response or simply an echo? The frequency of the call increases, sounding more urgent, the gurgling noises and rustling adding to the building sense of anxiety. A drone appears, the chirps fade into the background, while in the foreground more recognizable birdsong dances across the stereo field only to be drowned out in white noise. The tone of the drone and white noise is pitched up, if anything else is left underneath its been utterly blurred out by the noise. A sudden cut and the drone fades out, the piece ending with a gentle coda of chirps. Released by the Störung label, despite the typical austerity Alex Prieto has designed packaging that is a brilliant companion to López’s work. 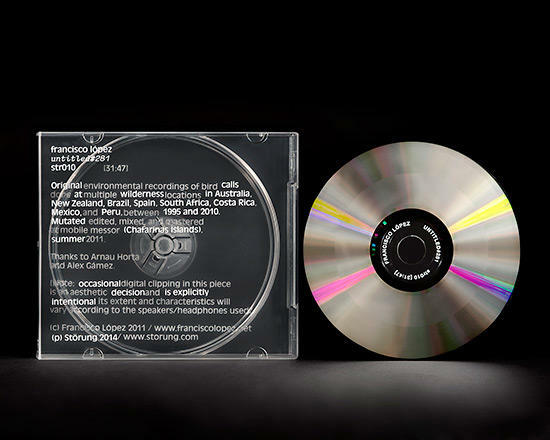 The case is a softer clear plastic, slightly thicker than a typical jewel case. Half of the text is printed on the front, the missing words on the back. Because the case is clear, the complete sentences are legible when the disk is absent, however when the disk is in place, or absent but the case opened, the remaining text is fragmented. Fragments can generate meaning of their own. Just look at Greek poets [Sappho], philosophers [Heraclitus], and statues. Ruins come to have their own significance, independent of any intended meaning granted by the author, long since lost to time. Come to think of it, the Schaeferrian reduced listening championed by López, which itself drew on the Pythagorean concept of acousmatics, has always been about severing the artistic insistence on ‘intentionality’ and instead focusing on the materiality of the sound-in-itself independent of causality.